Not to be confused with Lucky Bell. Lucy Belle is a character in the Saturday Supercade episode Double or Nothing. She is Bones's cousin who is trying to inherit a mansion once owned by her great grandfather. 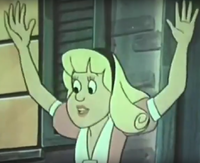 She first appears near the beginning of the episode, detailing her plans to inherit the mansion to Bones and Donkey Kong Jr., but also states that two figures might be eavesdropping on her. Before she can go on, the two figures kidnap her and tie her up in a nearby storehouse, evading attempts by Donkey Kong Jr. and Bones to stop them. She is not seen again until Donkey Kong Jr. and "Lucy Bones" free her. After they explain what they learned about the will of Lucy Belle's great grandfather, they left Lucy Belle to solve the rebus puzzle from the will while Donkey Kong Jr. and Bones distracted the figures. Afterwards, she was spotted by the figures after Bones's ruse was blown. Though Lucy Belle tried to fight back with a vase, the figures managed to pull out the carpet she was standing on and steal a piece of the rebus. After Donkey Kong Jr. thwarted the theft and revealed the figures as Mr. Bancroft, the executive, and Hugo, the caretaker, he returned the stolen piece of the rebus to Lucy Belle, who managed to solve the puzzle ten seconds to midnight. Lucy Belle then admitted that she couldn't have solved the puzzle without Donkey Kong Jr.'s and "Lucy Bones"'s assistance. According to Lucy Belle, her favorite fairy tale is Rumplestiltskin. This page was last edited on April 6, 2018, at 06:43.